Home » Zulu group with weapons. South Africa 1876. Orig. : Groupe de Zoulou. Gravure de M.Thiriat, d’après une photographie de M. Jameson. Source: Nouvelle Géographie universelle. La terre et les hommes par Élisée Reclus. Paris Libraire Hachette et Cie 79, Boulevars Saint German, 19. 1879. The Kingdom of Zululand (on Zulu: Wene wa Zulu) was a Zulu state in the north of the present province of KwaZulu-Natal in South Africa. It stretched from the rivers Tugela in the south to the Pongola in the north. In the west it was bordered by the Orange Free State, to the east by the Indian Ocean. 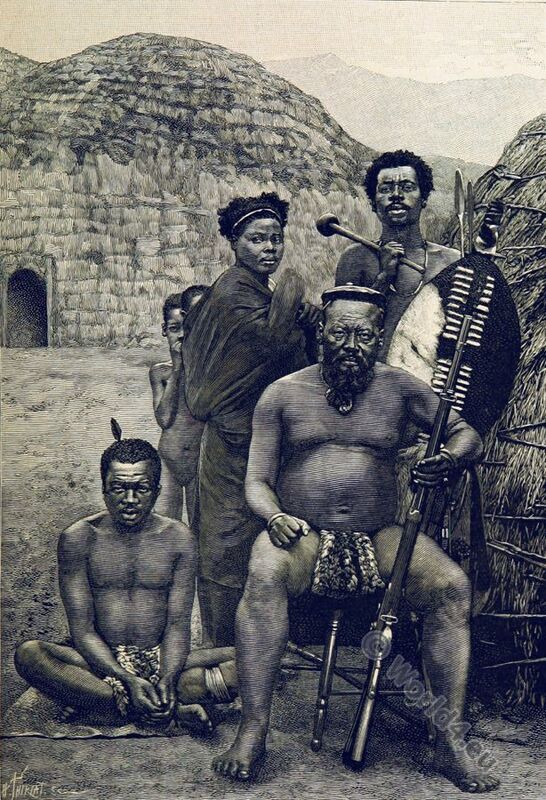 Zululand was established around 1820 from the Mthethwa Confederation by the union of the Zulu clans under King Shaka. His state existence ended in 1879 with the defeat of the Zulu against the British in the Zulu war. 1887 became the formally still independent Zululand British protectorate and 1897 part of the colony Natal. African tribe of Yetsang. Hairstyle. Africa. 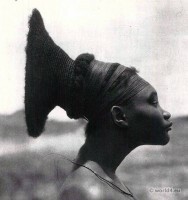 Girl from Timbuktu. Historical clothing. 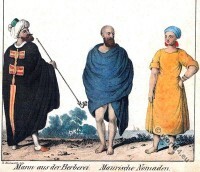 Moorish nomads. Berber from Algeria, North Africa. African tribe Ovambo women, Ondonga.